Severe soil erosion in a wheat field near Washington State University, USA. 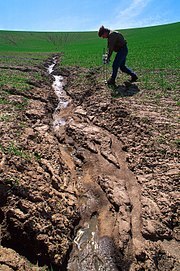 Severe soil erosion in a wheat field near Washington State University, USA.Erosion is the removal of solids (sediment, soil, rock and other particles) in the natural environment. It usually occurs due to transport by wind, water, or ice; by down-slope creep of soil and other material under the force of gravity; or by living organisms, such as burrowing animals, in the case of bioerosion. Main agents of Erosion Are Water, Wind, Ice, and Waves. Water is the most important erosional agent and erodes most commonly as running water in streams. However, water in all its forms is erosional. Raindrops (especially in dry environments) create splash erosion that moves tiny particles of soil. Water collecting on the surface of the soil collects as it moves towards tiny rivulets and streams and creates sheet erosion.In streams, water is a very powerful erosional agent. The faster water moves in streams the larger objects it can pick up and transport. Fine sand can be moved by streams flowing as slowly as three-quarters of a mile per hour.Streams erode their banks in three different ways: 1) the hydraulic action of the water itself moves the sediments, 2) water acts to corrode sediments by removing ions and dissolving them, and 3) particles in the water strike bedrock and erode it.The water of streams can erode in three different places: 1) lateral erosion erodes the sediment on the sides of the stream channel, 2) down cutting erodes the stream bed deeper, and 3) headward erosion erodes the channel upslope. Erosion by wind is known as aeolian (or eolian) erosion (named after Aeolus, the Greek god of winds) and occurs almost always in deserts. Aeolian erosion of sand in the desert is partially responsible for the formation of sand dunes. The power of the wind erodes rock and sand. The erosive power of moving ice is actually a bit greater than the power of water but since water is much more common, it is responsible for a greater amount of erosion on the earth’s surface.Glaciers can perform to erosive functions – they pluck and abrade. Plucking takes place by water entering cracks under the glacier, freezing, and breaking off pieces of rock that are then transported by the glacier. Abrasion cuts into the rock under the glacier, scooping rock up like a bulldozer and smoothing and polishing the rock surface. Waves in oceans and other large bodies of water produce coastal erosion. The power of oceanic waves is awesome, large storm waves can produce 2000 pounds of pressure per square foot. The pure energy of waves along with the chemical content of the water is what erodes the rock of the coastline. Erosion of sand is much easier for the waves and sometimes, there’s an annual cycle where sand is removed from a beach during one season, only to be returned by waves in another. It is in the first paragraph. To me gravity is the force behind many processes of erosion. and also add more of the definition of your agents……. Soil erosion is the washing,wearing and sweeping away of the land surface by physical forces.